This graph shows the U.S. government's FISMA expenditure as share of total IT spending in the fiscal years 2007 to 2015. 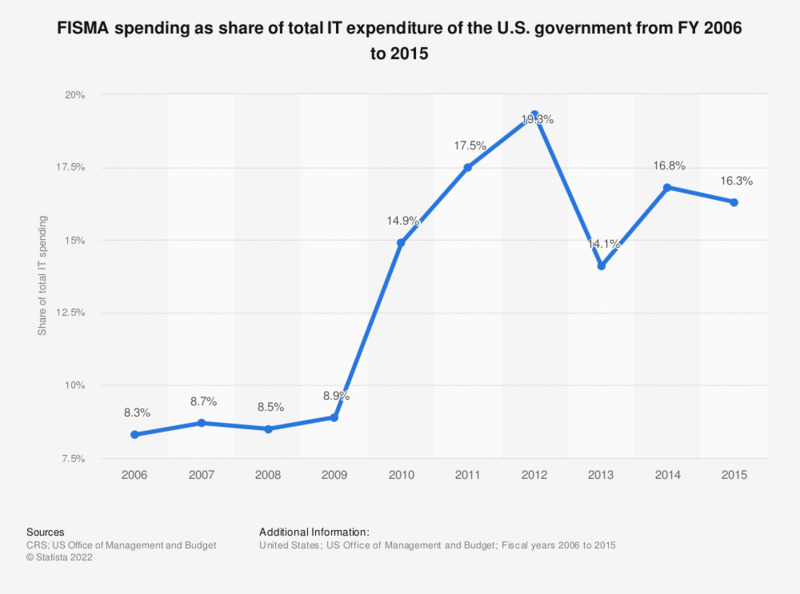 In the most recently reported period, Federal Information Security Management Act (FISMA) spending accounted for approximately 16.3 percent of total federal IT spending, down from 16.8 percent in the previous period. FISMA data for FY2006-FY2009 are not comparable to later data, and data from 2013-2015 are not comparable to earlier data, because of changes in how OMB collected the information implemented in 2010 and again in 2013. Amounts for both FISMA and IT spending are reported in the documents as “actual” expenditures and therefore probably consist mostly of obligated funds. Federal documents provide data as IT, not ICT, spending, but include investments in activities such as telecommunications. FISMA spending may not fully account for all agency investment in cybersecurity. Agencies might not report funds spent on cybersecurity beyond what FISMA requires in their submissions that are summarized in the annual FISMA reports. Therefore, the total amounts spent on cybersecurity might exceed the amounts presented in the table. What percentage represents the security budget compared to the IT budget? In 2015, how has the information security budget evolved compared to the previous year? In the event of a serious computer threat, what is the average time to deploy the necessary corrective measures within your company?